Buzzer Barrage is the twenty-sixth level in the game, Donkey Kong Country 3: Dixie Kong's Double Trouble! It is also the first area of Razor Ridge along with it being the first cavern level. In this level, Dixie and Kiddy Kong will turn into Quawks, who will aid them in flying through the area. 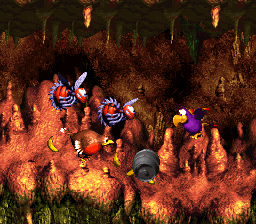 Because he is unable to shoot eggs, Quawks will have to use barrels to defeat the Buzzes found throughout the level. Kopters make their debut here. At the start of the level, Dixie and Kiddy must jump into an Animal Barrel to turn into Quawks. He should then fly through the level and enter a nearby barrel with a Buzz blocking Quawks's path. Once the enemy is defeated, Quawks must traveling throughout the cavern, while avoiding many Kopters. Quawks then must descend into a small gap at the end of the area and flap west. After Quawks makes a small U turn around the area, he will find a barrel. Picking it up with his talons, Quawks must carry it to three red Buzzes and a Booty Bird. He will need to let the barrel roll under the Buzzes and hit the Booty Bird, revealing the letter O. Then Quawks must continue avoiding more Kopters and use another barrel to defeat a Buzz underneath three red Buzzes. Afterwards, Quawks must descend down out of the unblocked passage. Quawks must then evade two Kopters as he falls into a small gap. At the end of the gap, Quawks must continue to find another gap in the ceiling. Quawks must then a Kopter in a gap and a Buzz to enter a wide area full of Kopters. Quawks must then continue on to reach the Star Barrel. Halfway throughout the level, Quawks must continue on and enter a wide area with several Buzzes. After Quawks goes around every Buzz, he will move through a small passageway and fly to the far-right part of the area to spot a small gap again. Quawks must then sneak through a small alcove and dodge a Kopter and can nab the letter N. Afterwards, Quawks must exit the area and continue traveling through another open area. Once Quawks heads upwards between some rocky walls, he will find a barrel to the right. Quawks must carry it and defeat the bees with the barrel, Quawks must then pass the Buzzes and get another barrel and pass a Kopter, to defeat a green Buzz blocking his path. Quawks must then defeat a Buzz with the barrel and fall downwards, where he will find a wide, open space, along with a barrel. Quawks must carry the barrel past two Kopters in a tight gap and defeat a Buzz blocking his path. Once Quawks defeats the Buzz, he must pass a DK Barrel and continue through a small, U shaped pathway. After Quawks gets through the U-shaped pathway, he must fly to a Barrel and drop it between some red Buzzes. The barrel will roll down the rocky surface into a Buzz, defeating it. Quawks can then continue throughout the level. When Quawks exits the long, tube-like pathway, he will find another barrel below him. The barrel should be used to defeat some green Buzzes. If Quawks manages to pass the Buzzes, he will hover through another area with many Kopters. Quawks must avoid the Buzzes and move through a second U shaped pathway to find another barrel. If Quawks drops it past a red Buzz, the barrel will roll into another green Buzz, creating another opening for Quawks. Once Quawks goes through this opening, he will pass a No Animal Sign, turning him back into Dixie and Kiddy. The Kongs must then pass a lone Kopter to find a flagpole to advance to the next level. At the beginning of the level, the Kongs must transform into Quawks and fly east. Quawks must then fly through a long cavern until he finds a wide passageway leading downwards. Quawks must ignore it and continue on and find a couple of Buzzes. When Quawks defeats the Buzzes, he must continue downwards into a gap below to enter a Bonus Barrel. Here, Quawks must use barrels to defeat seven Buzzes. Once all the Buzzes are defeated, a Bonus Coin will appear in the top right-hand corner of the area and Quawks will then complete the level. At the end of the level, the Kongs must find a Kopter flying in and out of a few gaps in the ceiling. When the Kopter hovers over to the left gap, the Kongs must bounce on his helmet and fly upwards with it. They will then find a Bonus Barrel as When the Kongs enter the Bonus Level, they must bounce on top of a Kopter to collect stars. Once all of the stars are collected, a Bonus Coin will appear nearby. Shortly after the Star Barrel, Quawks must locate a Koin with the DK Coin. Quawks doesn't have any attacks of attacking the Koin. So, Quawks must fly upwards and move between two Kopters in a small alcove to find a Steel Keg. Quawks must pick up the barrel and head back to the Koin and then drop the barrel to the left of it. The barrel then will roll into the Koin as Quawks flies above the distracted it. Koin then will be defeated, and it will give out the DK Coin. K: Obtained by defeating a Booty Bird past some Kopters at the beginning. O: The "O" Letter, similar to the "K" letter, is also collected by defeating a Booty Bird. It is encountered beneath two Red Buzzes; a Steel Barrel can be rolled under the Buzzes to reach the Booty Bird. N: Found past the Koin. G: There will be a point in the level where the path is blocked by three Green Buzzes. A wooden barrel must be used to defeat the top Buzz to access the "G" Letter. This page was last edited on April 10, 2019, at 13:36.